Learn the right way to make your resume stand out for an assistant teacher position. Resume tips for an assistant teacher. Is your resume in a class all its own, or could it use some extra attention? Consider this today’s lesson: To be a successful candidate for teaching assistant jobs, resume expert Kim Isaacs says it helps to have a comprehensive resume. 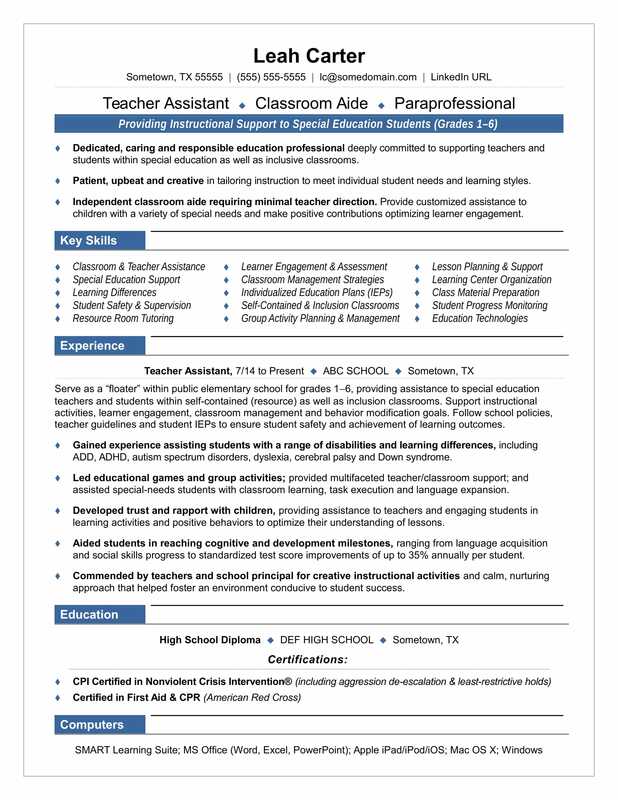 For writing tips, view this sample resume for a teaching assistant that Isaacs created below, or download the teaching assistant resume template in Word. Jobs for teacher assistants are projected to grow by 8% (or 109,500 jobs) from 2016 through 2026, according to the Bureau of Labor Statistics (BLS). You'll find the highest level of employment for this job in the following states: California, New York, Texas, Illinois, and New Jersey; and in the following metropolitan areas: New York City; Los Angeles; Chicago; Nassau, NY; and Minneapolis. As a teacher assistant, you can expect to earn a median wage of $26,260 per year, according to the BLS. Additionally, you can learn about education careers and search for teacher assistant jobs on Monster. Dedicated, caring and responsible education professional deeply committed to supporting teachers and students within special education as well as inclusive classrooms. Patient, upbeat and creative in tailoring instruction to meet individual student needs and learning styles. Independent classroom aide requiring minimal teacher direction. Provide customized assistance to children with a variety of special needs and make positive contributions optimizing learner engagement. Serve as a “floater” within public elementary school for grades 1-6, providing assistance to special education teachers and students within self-contained (resource) as well as inclusion classrooms. Support instructional activities, learner engagement, classroom management and behavior modification goals. Follow school policies, teacher guidelines and student IEPs to ensure student safety and achievement of learning outcomes. Gained experience assisting students with a range of disabilities and learning differences, including ADD, ADHD, autism spectrum disorders, dyslexia, cerebral palsy and Down syndrome. Led educational games and group activities; provided multifaceted teacher/classroom support; and assisted special-needs students with classroom learning, task execution and language expansion. Developed trust and rapport with children, providing assistance to teachers and engaging students in learning activities and positive behaviors to optimize their understanding of lessons. Aided students in reaching cognitive and development milestones, ranging from language acquisition and social skills progress to standardized test score improvements of up to 35% annually per student. Commended by teachers and school principal for creative instructional activities and calm, nurturing approach that helped foster an environment conducive to student success. Just as you'd instruct your students to look over their homework before handing it in, so should you review your resume before submitting it to a job ad. But you've got one thing going for you that your students do not: You have experts at your disposal. Want to be sure your resume is ready for hiring managers? Get a free resume evaluation today from the experts at Monster's Resume Writing Service. You'll get detailed feedback in two business days, including a review of your resume's appearance and content, and a prediction of a recruiter's first impression. That's like an A+ in the books for you.